In this week’s video, Mike Cintolo, chief analyst of Cabot Growth Investor and Cabot Top Ten Trader, has some good news—his intermediate-term indicator has flashed a green light! That’s not a reason to go hog wild on the buy side, but Mike’s putting some money to work in potential leaders and will be watching the next few trading days carefully; the more stocks that can join the party, the greater the chance this rally will get legs. 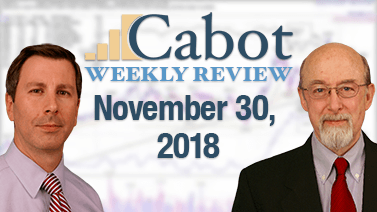 cabot, cabot growth investor, cabot top ten, cabot top ten trader, cabot weekly review, growth investor, investor, market news, mike cintolo, stock, stock picks, stocks, top stock, top stock picks, trading, wall street.